Boston Harbor Hotel’s Executive Chef Daniel Bruce at the Bay Club! Bay Club members recently welcomed Daniel Bruce, Executive Chef at the five star Boston Harbor Hotel at Rowes Wharf to the club for a special cooking demonstration and book signing. Bay Club Executive Chef Jim Mercer joined Daniel to demonstrate how to prepare White Bean, Sun-dried Tomato and Basil Dip as well as Pan-Roasted Striped Bass with Orange Ale Essence. These recipes, along with a collection of easy to make recipes for the home cook, are featured in Simply New England, Daniel’s first cookbook released in November. All who attended received a personally signed copy of the book. Internationally-renowned, Daniel Bruce has been awarded the title of Vice Consellier Culiniaire, Bailliage de Boston, and he has been honored twice as one of the “Best Hotel Chefs in America” at the James Beard House. 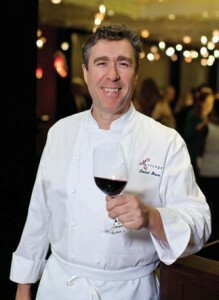 In 2009 Daniel was the featured chef at the Celebrity Chef and Winemaker Auction Dinner at the Nantucket Wine Festival, as tribute to two decades of dedication to wine and food education. Additionally, Daniel is an honorary member of Chevalier du Tastevin and has been recognized by Boston magazine as the city’s Best Hotel Chef. Daniel has made numerous live television appearances on national programs such as NBC’s Today and Live with Regis and Kelly. He was awarded an honorary doctorate from his alma mater, Johnson & Wales University in 1996 and in 2013, Daniel was awarded Chef of the Year by the Massachusetts Restaurant Association.